Over the past year, I’ve found Ancestry.com to be an excellent tool for organizing and researching my family’s history. Unfortunately, sharing the information isn’t quite as easy. I’d like to be able to share the family tree with family members while allowing the rest of the world to see public examples I write about here. I’ve invited family members to my tree on Ancestry.com, and they can view some of the information, but they can’t view everything I’ve discovered without paying a fee. And if they don’t pay the fee, they are bombarded with advertisements and other annoyances in order to convince them to sign up for a paid membership. I have no interest in seeing my family part with their money, so I’ve been looking for a better solution. I’ll continue to use services and software like Ancestry.com, Family Tree Maker, and MyHeritage for my own management and research pertaining to my family history, but I will also host a public, free-to-access, version of the tree here on landesfamilytree.com. The interface is not as polished as it is on Ancestry.com or any other commercial tool, but it provides access to the information to visitors and members, free of charge. 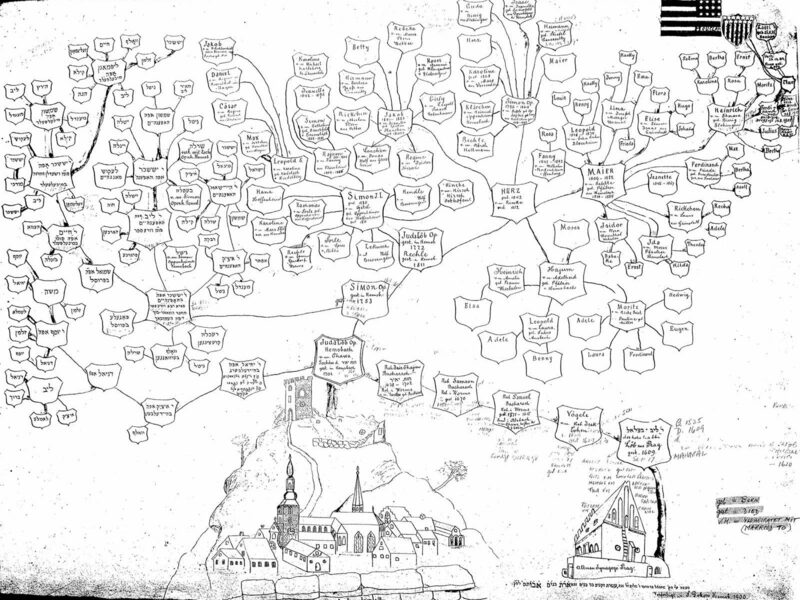 You can access the family tree website here. Currently, it contains almost 5,000 individuals, focusing mainly on my ancestors and their descendants, but I’ve also researched somewhat distant branches of the family and added them to the tree if I felt there was a good enough reason to do so. In order to see details about living persons and other information like sources and certain media, you must log in after requesting a new account. Because of the nature of private information available, I’ll approve new accounts for only family members. Otherwise, only certain basic information will be visible. After writing about piecing together more details about the Lepianski branch, I was contacted by a cousin who provided more details. I knew that several of Anna (Khiene Liba) Lepianski Kerstman’s brothers and sisters found their way from Yanowa, Poland (now Lithuania) to the United States, but I hadn’t discovered their whereabouts. The cousin was closer to this family and provided more information on Moisei Isaak Lepianski, who became known in the United States as Morris Lopinsky. I’m still on the look-out for Anna’s sister Esther (Ester Leia). I most recently wrote about my relatives who perished in the Holocaust. Sophie Heimbach, my second cousin three times removed and a Sturmwald descendant, and her father both perished. Sophie’s two sisters, Frieda and Ida, both left Europe for the United States during the first decade of the twentieth century. I’ve been able to find more information about Frieda Heimbach, who married Christian Schaefer. While reviewing my DNA matches using FamilyTreeDNA and Gedmatch, I’ve encountered several matches who are related to the Oppenheimer family, a prominent Jewish family from Germany. The Oppenheimers have many living descendants, and more than just a few are interested in tracking their family history. One branch of the Oppenheimers (Feygele, daughter of Samson Oppenheimer) consists of ancestors of a Royal Dutch family. I’ve known of my own connection to the Oppenheimers as one several marriages away from my own lineage, but I’m wondering if DNA evidence is pointing to a closer connection. There’s no definitive conclusion as a result of DNA analysis yet, but I’m continuing to try to make sense of what is known. In my research, I found this diagram of the Oppenheimer family tree courtesy of the Loeb Family Tree website. 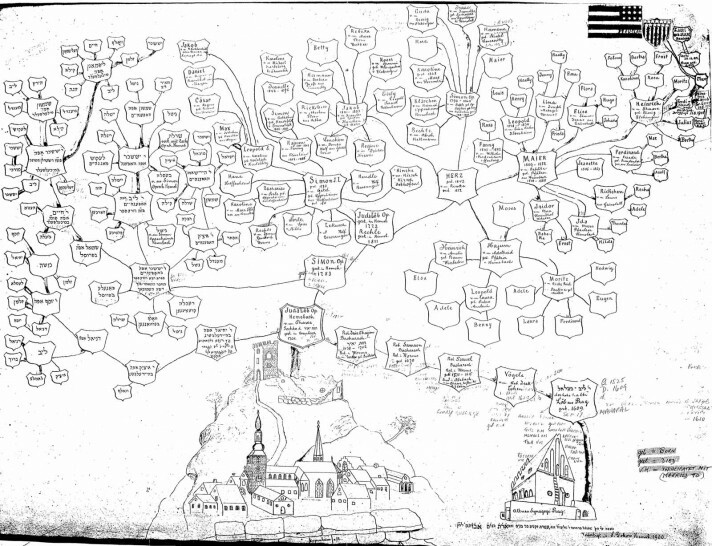 According to the author of the site, this tree was drawn by Samuel Dokow of Hemsbach in 1900.